Given the state of the world today, many of us have probably contemplated the notion of getting away from the stress of daily life, living off the grid to achieve a simpler existence. Eschewing a routine fraught with economic, social and even interpersonal tensions in favor of a more idyllic existence no doubt holds much appeal to those who feel overwhelmed by the spiraling demands of living in an increasingly frustrating world. Those who have a particularly difficult time coping with such conditions may find the prospect especially attractive. But is this really the answer? Or are other arrangements more suitable? And are we going about exercises like this with a clear mind and for the right reasons? 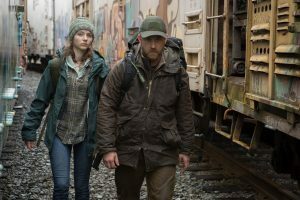 Those are the issues faced by a father and daughter seeking to find meaning for themselves in director Debra Granik’s emotionally powerful new drama, “Leave No Trace” (web site, trailer). Will, a middle-aged single father and former Marine (Ben Foster), and his teenage daughter, Tom (Thomasin Harcourt McKenzie), live an unconventional life in the forests near Portland, Oregon. Their secluded base camp provides them the necessities of life, as well as a few modest comforts and the materials necessary for Tom’s education. They grow or hunt for much of their food, but they periodically venture into civilization to obtain what Mother Nature doesn’t provide for them. It’s a life that demands much, but they seem fairly content, unburdened by many of society’s frustrations. Living off the grid in the woods offers single father and former Marine Will (Ben Foster, right) and his teenage daughter, Tom (Thomasin Harcourt McKenzie, left), a chance to escape the frustrations of society in the powerful new drama, “Leave No Trace.” Photo by Scott Green, courtesy of Bleecker Street Media. Perhaps the biggest challenge Will and Tom face is keeping themselves from being discovered. They periodically conduct drills where they practice hiding from authorities who might try to forcibly remove them from squatting on public lands. Otherwise, though, they appear to have their bases covered and their stress level relatively under control. And that’s important for Will, given that he suffers from PTSD. Try though they might to remain inconspicuous, however, Will and Tom are eventually found out. They’re removed from the woods and placed under the auspices of social services. Father and daughter are assigned to two social workers, Jean (Dana Millican) and James (Mike Prosser), to assist them in their return to society. They arrange housing for Will and Tom in a small but comfy home located in a rural setting, placing them in conditions not identical but similar to what they previously had. They also secure work for Will as a farmhand at a Christmas tree nursery, an offer extended by the company’s kindly owner, Mr. Walters (Jeff Kober). Tom, meanwhile, gets an opportunity to meet other local teens, enabling her to form social connections with peers, probably for the first time in her life. She takes a particular liking to Isaiah (Isaiah Stone), an aspiring farmer with an affinity for raising rabbits. 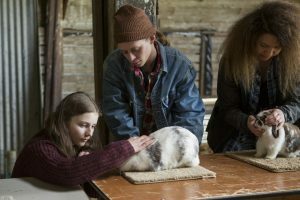 Aspiring farmer Isaiah (Isaiah Stone, right) instructs his new friend, Tom (Thomasin Harcourt McKenzie, left), in the ways of raising rabbits at a 4H meeting in director Debra Granik’s latest offering, “Leave No Trace.” Photo by Scott Green, courtesy of Bleecker Street Media. However, despite the comparatively inoffensive nature of these new arrangements, Will quickly grows restless. He feels trapped, that he’s being forced into “adapting” to a world of which he wants no part. Tom tries to convince him that their new circumstances aren’t so bad, that they can learn to adjust to them, and that they always have the freedom to think their own thoughts, no matter how conventional their housing or work arrangements might be. But, as assuaging as Tom tries to make her arguments, she’s unable to sway her dad’s feelings, and, early one morning, he wakes her so that they can hit the road to escape – and to launch into a journey with an uncertain future. With no definitive sense of direction, the duo quickly becomes lost, both literally and figuratively. Over the course of their odyssey, they encounter a number of challenges, some of which they’re not prepared to handle, despite their years of experience living off the grid. Several Samaritans cross their path to offer help and insight, including a friendly truck driver (Art Hickman), the manager of a small woodland trailer park (Dale Dickey), a former military medic (David M. Pittman) and a thoughtful beekeeper (Susan Chernak McElroy). But, even with such assistance, their fate is unclear, partly because of the unexpected perils they face, as well as a growing distance that’s opening up between father and daughter. With the emergence of differing agendas, the closeness that has long characterized their relationship is being put to the test. When trouble strikes, Dale (Dale Dickey, left), manager of a small woodland trailer park, offers assistance to Tom (Thomasin Harcourt McKenzie, right), a teen on the road with her father, in the new emotionally charged drama, “Leave No Trace.” Photo by Scott Green, courtesy of Bleecker Street Media. Considering how long (and apparently how well) Will and Tom managed to live off the land, one might be convinced that they are quite adept at successfully creating an alternate lifestyle for themselves. But is the manifestation of a hoped-for material outcome all there is to this? While it’s true that Will and Tom are quite capable of working out the mechanics of achieving the physical result they want, can the same be said for them arriving at an understanding of why they did it? What drove them to do what they did? To escape everyday life, single father and former Marine Will (Ben Foster, right) and his teenage daughter, Tom (Thomasin Harcourt McKenzie, left), hit the road in “Leave No Trace.” Photo by Scott Green, courtesy of Bleecker Street Media. One could say that they sought to enjoy the benefits of living off the grid, of getting away from the troubling trappings of modern society, an effort not unlike what Henry David Thoreau did when he moved to Walden Pond. However, as becomes apparent over the course of the film, Will, it seems, has also made this move to escape the pain of his past, including the loss of his wife and the trauma associated with his military service. In light of the foregoing, one can’t help but ask, was Will seeking solitude from his pain, or was he simply running away from his life? The further one gets into the story, it’s easy to see that Will’s anxious to hide at almost any cost, even going so far as to move forward without a plan for how to proceed, a circumstance that could lead to calamity. The ramifications behind this could be staggering, because, even though he may be able to physically escape to the woods, can he really evade his personal demons? Unless he makes an attempt at addressing this issue, it will continue to dog him, no matter how far he gets away from society. What’s more, Will assumes that, because Tom is his daughter, she will automatically follow him, as her provider, wherever he goes, even if his actions don’t make sense or fail to meet their respective needs. But is that indeed true? With Tom reaching the age where she’s able to assert her independence, who’s to say that she will just go along with what Will does simply because he’s her father? These considerations thus illustrate the importance of clearly understanding the nature of our actions. We must also be honest with ourselves about this, because, if we’re not, we run the risk of falling prey to wishful thinking, leading to results that are distorted or could culminate in disappointment and disillusionment. 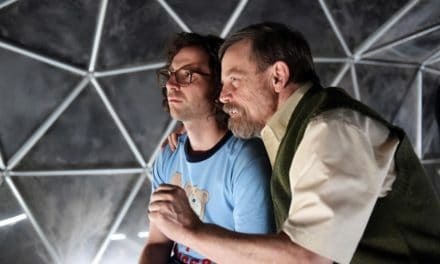 There are lessons in this for both father and daughter, but they’re especially critical for Will, not only in terms of his quality of life, but also for his relationship with Tom and, above all, his peace of mind. To put it metaphorically, the forest will always be there, even if we can’t see it for the trees; yet, if we hope to benefit from everything the woods have to offer, we had better make sure our vision is sharp. 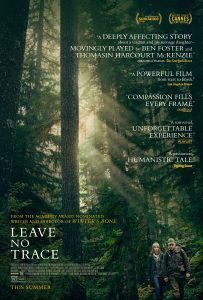 “Leave No Trace” offers viewers a powerful tale about living off the grid, dealing with adaptation to society’s expectations and reconciling our feelings about our past. The film’s superb performances and beautiful cinematography lend much to an engaging story that undoubtedly captures the kinds of smoldering sentiments many of us feel but don’t necessarily have the courage or wherewithal to act upon. Admittedly, he narrative meanders a bit much at times, but, considering the nature of the story, that’s probably not entirely unexpected. 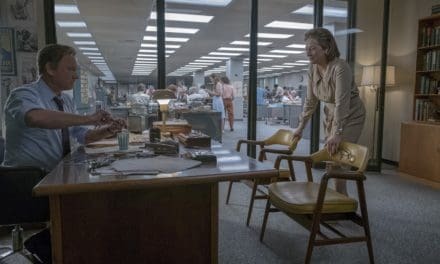 A little tightening in the editing, as well as a better fleshed-out back story, would have helped considerably, changes that could have made a good film a truly great one (though, as it stands now, it’s certainly one of 2018’s better offerings). Living our lives with personal integrity is undoubtedly a noble pursuit, even if it just means creating a satisfying personal existence that suits our individual perspective and not necessarily fulfilling lofty accomplishments that benefit greater mankind. But, in pursuing such a path, we must be conscious of what we do, to live with awakened, informed intent and presence of mind. To do otherwise can lead to an exercise in self-delusion, one that could possibly leave us interminably lost in the woods of our being with no way out. Have you ever wondered what it would be like to meet yourself? The prospect might make some of us a little uncomfortable. But, for others, there could be a degree of comfort, a reassurance that you’re fine as you are because there’s another one just like you. And then there are situations where both of the foregoing considerations, along with a host of others, might well come into play, leaving you more confused – and unsettled – than ever. 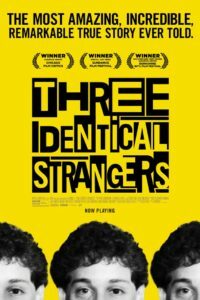 So it was for a trio of siblings separated at birth, as detailed in the captivating new documentary, “Three Identical Strangers” (web site, trailer). In 1980, 19-year-old Robert Shafran was preparing to enroll as a freshman at Sullivan County Community College in New York’s Catskills Mountains. Upon arriving, he was warmly greeted by a number of students who acted as though they recognized him, saying they were surprised to see him, because they “didn’t think he was coming back.” Needless to say, Robert was mystified by their statements, but, when one of his new classmates called him “Eddy,” he knew something was up. When Robert explained that Eddy was not his name, his exasperated classmate suggested that he must have an identical twin, one who looked exactly like him who had attended the college the year before but had not made plans to return – and one whose existence was unknown to the now-befuddled Robert. After a hasty phone call to Eddy that included a comparison of birthdates, birth locations and information about their respective adoptions, they realized that they must have somehow been separated at birth. Robert met Eddy Galland shortly thereafter, saying that it was like looking in a mirror. Their remarkable tale soon became a heartwarming headline grabber in the Long Island tabloid Newsday. But their reunion was just the beginning of the story. At the time the Newsday article was published, David Kellman found himself staring into a mirror as well. After comparing his birthdate, birth location and adoption information to the other two, he found an identical match as well. And, upon meeting Eddy and Robert, he knew he was the third pillar in this most unusual triad. Even though Robert, Eddy and David came from different family backgrounds, many of the similarities among them – appearance, habits, preferences and so on – were uncanny. They fit together like hand in glove, often mimicking one another and even finishing each other’s sentences. It led to a bond that drew them extremely close to one another. The unique nature of the story also led to the long-lost brothers becoming media sensations. They appeared on numerous talk shows, such as The Phil Donahue Show and The Today Show. They were the toast of New York, frequenting such trendy nightspots as Studio 54, and they opened a highly successful restaurant, Triplets. They even made a cameo appearance in the quirky hit comedy “Desperately Seeking Susan” (1985). But, despite their notoriety, burning questions about their past persisted, most notably, why were they separated at birth by the adoption agency? The siblings’ adoptive parents wanted answers, especially since the boys were each placed with such disparately different families. That inquiry, coupled with the subsequent probe of an investigative reporter, opened a can of worms that changed everything. To say more would reveal too much about the incredible mystery behind this story. Suffice it to say, however, that, once facts about the background of this saga came to light, the relationship among Robert, Eddy and David was never the same. This was particularly true as the differences among them began to emerge. While there were indeed many commonalities that they shared, there were also some significant distinctions that set them apart – and even divided them – with consequences and implications that were truly shocking. “Three Identical Strangers” packs a lot of information into its narrative, much of which has to do with bigger issues than just telling an interesting story. It examines the age-old question of “nature vs. nurture” in human development. It delves into the power of others (especially those in positions of authority) to manipulate our lives. But, most of all, it thoughtfully examines what it means to be who we are, particularly as seen through the eyes of those most close to us, namely, our families and, in the case of the brothers, our birth mates. Expect a rollercoaster of emotions while watching this sometimes-intense, sometimes-heartwarming, sometimes-humorous and sometime-heartbreaking documentary. 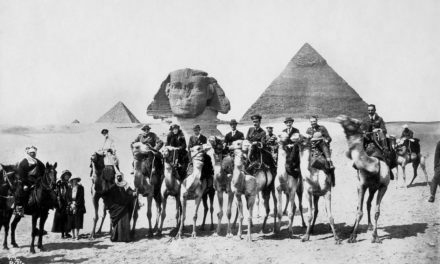 Director Tim Wardle’s well-researched, meticulously crafted film tells its unbelievable story in great factual detail but in a way that also effectively evokes the emotions it was meant to engender. The film combines interview segments with the principal figures in this story, along with a wealth of archive footage. A number of incidents have been re-created using actors, but descriptions of those circumstances are backed up by voiceovers narrated by the principals involved. “Three Identical Strangers” is easily the best documentary of the year thus far and one worthy of well-deserved accolades come awards season. As much as we like to think we know who we are, sometimes situations come along that totally upend our self-awareness, sometimes for the better, sometimes not. When such scenarios unfold, though, it helps immeasurably to be grounded in what we take to be our own sense of self. Drawing upon such knowledge may spell the difference between a happy and healthy existence and a spiral into chaos and confusion. Staying flexible, but holding firm to what we know internally to be true could make a huge difference in the reality we ultimately experience. How far would you go if you found your life on the line? Would you put yourself first at all costs? Would you capitulate to the whims of others, despite the consequences? Or would you seek to arrive at a solution that benefits everyone, a win-win for all? That’s a question put to a space-faring crew in the chilling new sci-fi adventure, “5th Passenger” (web site, trailer), now available on DVD and video on demand and coming soon to Blu-ray disc. In 2151, the world is thrown into chaos with the eruption of the Yellowstone caldera. The environment quickly deteriorates, making survival difficult. It also leads to a social conflict in which people are classified as “citizens” and “non-citizens,” a distinction whose basis is apparently driven, as usual, by money and clout and that leads to significant differences in privilege. Those fortunate enough to be declared citizens are allowed to seek asylum in domed cities and off-world colonies. Non-citizens, meanwhile, are left to fend for themselves, though some are “fortunate” enough (if one could call it that) to land positions as servants and support staff aboard spacecraft shuttling citizens to new lives on the distant planet Hesperides. However, while these non-citizens are spared the perils of surviving earth’s environmental degradation, they’re not spared the discrimination routinely thrust upon them by citizen passengers who treat them as little better than vermin. When a spacecraft headed for Hesperides intercepts an escape pod from another ship, its captain (Herman Wilkins) and medical officer (Marina Sirtis) are presented with a mystery – why is only one of the four passengers it’s designed to carry still alive? Answers won’t come easily, either, as that lone survivor, Eve Miller (Morgan Lariah), a non-citizen bridge crew member, is near comatose and largely unresponsive. To discover the mystery of what happened, the rescue crew employs a memory scanning technology to learn the truth of what took place on that escape pod. As the truth emerges, it’s revealed that the mother ship of the escape pod ran into an asteroid field that tore it to bits. With the crew frantically seeking to abandon ship, an escape pod designed to support four (and only citizens) was boarded by five passengers, including Eve, medical officer Myers (Armin Shimerman) and agricultural specialist Thompson (Manu Intiraymi), all of them non-citizens, along with Captain Franklin (Tim Russ) and citizen passenger Li (David Lim). Given the unbalanced nature of the passenger load, it quickly becomes apparent that the escape pod is unlikely to make it to a safe destination or to rendezvous with a rescue ship – that is, unless some desperate maneuvers – or measures – are taken while supplies and oxygen last. Heated debates about how to proceed erupt, many of them driven by citizen status considerations. Yet, as events unfold, it quickly becomes obvious that the one most likely to determine a successful course of action is the one with the greatest technical and navigational knowledge, Eve. The question is, though, will she be given the chance to prove herself? Or will prejudicial concerns unduly impinge upon making use of her abilities as she seeks to save herself and all the other passengers? This intriguing sci-fi offering explores what it means to fight for our existence when our back is against the wall, not only on earth, but also in space and in a society where it may become all too easy for others to try and deny us our right to live. In that regard, the film presents a very scary prospect – what could happen to us if we were to face comparable circumstances someday? Will we recognize the need to work together to survive, or will we succumb to petty differences that threaten everyone’s existence? When we feel the need to fall back on arbitrary justifications in an attempt to maintain an old order that is fading away in hopes that they will somehow magically preserve the existence of said order, we had better think carefully about how we proceed. Our survival may well depend on it. While some of the film’s tropes ring a few clichéd bells, there are also twists and turns that make “5th Passenger” fresh and different. The film’s special effects are generally crisp (though there are few that are decidedly cheesy, perhaps deliberately so), and its ethereal soundtrack effectively enhances the narrative’s haunting mood. With a cast peppered by former “Star Trek” actors, the performances are mostly adequate, though a few are a little wooden, perhaps more a function of the dialogue than the delivery. Still, despite its shortcomings, for a production made on a shoestring budget, there’s certainly a lot to like here. 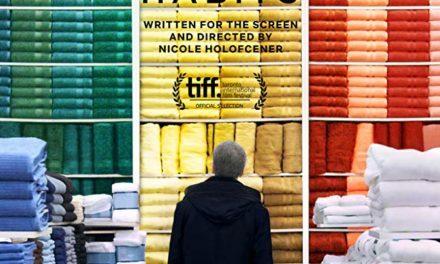 The picture’s brief theatrical run recently came to an end, but it is now available for a number of home viewing options. It’s been said that “none of us is as strong as all of us.” With a world falling apart, that could prove to be life-saving – or even species-saving – advice. 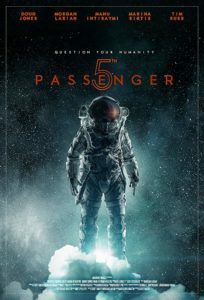 “5th Passenger” helps to show us that. We’d better pay attention, too.